State Budget Director Dan Haug said this is the first time general revenue would be used to help pay for roads and bridges. JEFFERSON CITY, Mo. — JEFFERSON CITY, Mo. (AP) — Missouri Gov. 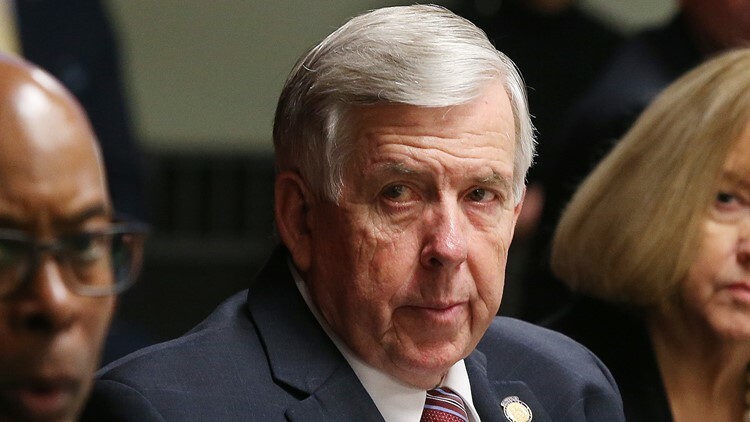 Mike Parson is proposing a $351 million bond to repair or replace 250 bridges across the state, a pitch he made to lawmakers Wednesday during his first State of the State speech since taking over when his predecessor resigned in scandal last year. Parson's plan comes after Missouri voters in November shot down a proposed 10-cent-a-gallon increase in the gas tax to pay for road and bridge repairs. Parson toured the state to try to persuade voters to pass the gas tax increase, and he's repeatedly cited improving the state's infrastructure as a top priority. "Over the years, we have seen proposals go before the voters and fail, but this cannot and does not mean we are expected to do nothing," Parson said in prepared remarks. "This is why I am asking you to consider an infrastructure plan. While funded through our budget savings, it will give us the ability to begin immediate work on nearly 250 bridges across the state of Missouri all in need of critical repair or replacement." All the bridges already are in the state's five-year construction program. That means the bonds would free up existing highway funds to be used for other projects. The plan won praise from backers of last year's failed gas tax proposal. "Governor Parson is doing the right thing by targeting bad bridges for replacement. For safety's sake, Missouri must keep working on the backlog of deficient bridges and every dollar helps," said Scott Charton, who served as spokesman for the gas tax campaign, in a statement. In his budget plan released Wednesday, Haug said the governor recommended keeping funding for the state's colleges and universities flat while giving K-12 public schools a roughly $61 million increase next year compared to this fiscal year, which would meet funding goals outlined in state law. That's on top of another $10 million the governor wants to spend on K-12 transportation. Prisoners and staff would be transferred to Western Missouri Correctional Center, which is also located in Cameron. The savings from the consolidation would help fund a pay raise for Department of Corrections personnel. This is Parson's first time outlining a proposed budget and delivering a State of the State address to Missouri's Republican-led Legislature. But Parson hasn't won over everyone. Democratic Senate Minority Leader Gina Walsh in a prepared response to Parson's speech called on an end to Republican-backed policies that Greitens pushed, such as efforts to enact right-to-work legislation banning mandatory union dues and a recent tax code overhaul. "Simply being better than Eric Greitens is too low a bar to set for any of our leaders, too low for the kind of change we need," Walsh said. "Missouri deserves better."